The 2020-2021 Fulbright U.S. Scholar Program Core competition is now open. The Fulbright Scholar Program offers teaching, research or combination teaching/research awards in over 125 countries for the 2020-2021 academic year. Opportunities are available for college and university faculty and administrators, as well as for professionals and many others. Interested faculty and professionals are encouraged to visit the Catalog of Awards to learn about opportunities in the field of Agriculture along with other fields. The application deadline for most awards is September 16, 2019. U.S. citizenship is required. Grant lengths vary in duration; applicants can propose projects for a period of two to 12 months, as specified in the award description. Flexible options may also be available. In addition, please note that Ohio State will hold its 10th Annual Fulbright Week during March 25-29, 2019. This initiative is co-organized by the Office of International Affairs, the Graduate School, and the Undergraduate Fellowship Office. As in the past, these three units have combined efforts to provide a full week of events acknowledging past Fulbright and Fulbright-Hays recipients and hosting workshops, information sessions and open houses designed to inform potential Ohio State faculty, undergraduate and graduate student applicants about the opportunities available through the Fulbright and Fulbright-Hays programs. All faculty, professionals and students are welcome to participate in a myriad of Fulbright Week activities. Congratulation to 2018 NEAFCS and JCEP Distinguished Service Award recipients Melanie Hart, Greene County, and Michelle Treber, Pickaway County. The awards were presented by NEAFCS President Candace Heer (l) and Kathy Goins-Tutt (r), past president. 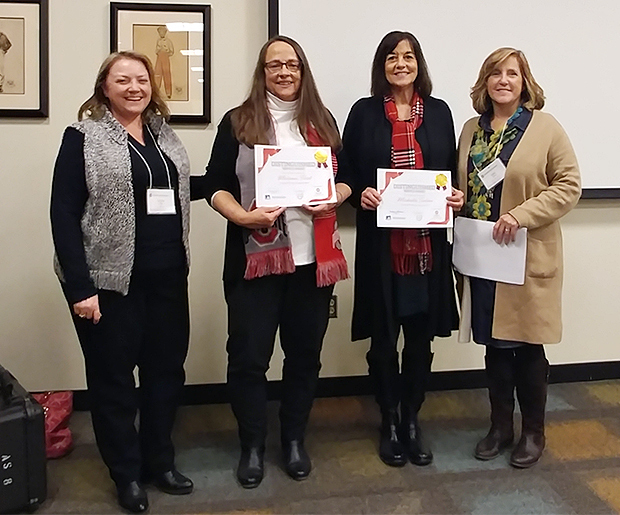 Lorrissa Dunfee, Ohio State University Extension Educator, Belmont County, was selected to serve as a board member of the Ohio Suicide Prevention Foundation. She will serve a three-year term. “I wanted to be able to bring to light issues here in Belmont County related to mental health and suicide, and then see across the state how other areas are dealing with it," she said. The mission of OSPF is to act as a catalyst and steward of statewide suicide prevention efforts by supporting community-based efforts to reduce stigma, promote education and awareness about suicide prevention, and increase resources and programs to reduce the risk of lives lost to suicide. Read more at ohiospf.org. Healthy Living Resources specialists Amanda Woods, Amy Meehan and Stacey Baker discuss "stress of foreclosure - where to get help, and what steps to take" with Greene County Educator Melanie Hart. Healthy Living Resources specialists Amanda Woods, Amy Meehan and Stacey Baker discuss "Stress and Your Mental Health During the Holiday Season" with Hardin County Educator Jami Dellifield. FCS has added two new 6 foot retractable pull-up display banners for attracting visitors to your booth or table at conferences or events. To reserve one of the display banners, contact Sarah Beaumont-White at beaumonut-white.1@osu.edu.